With a 400 year long history of cultivation of sugar fields, and consequently rum production, it is no surprise that many visitors to the island are curious about alcohol in Mauritius, and more importantly it seems, the cost of alcohol in Mauritius. Rum production started on the island nearly 200 years ago, although the Dutch introduced the key ingredient – sugar cane – to Mauritius a lot earlier than that, in fact almost 400 years ago. It was the French and British influences that kicked off the rum production for real in the late 19th century, and today Mauritius is renowned all over the world for its Green Island Rum and other popular brands. Some 100 years after the rum productions started, in the early 1960’s, Phoenix Beverages launched its now famous Phoenix Beer in Mauritius, a light lager designed for a hot, tropical climate. 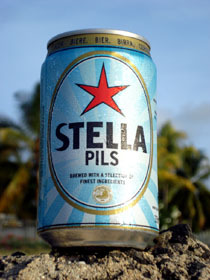 As of 2012, several new breweries have seen the light in the mountainous regions of the island, where Stag Beverages has risen to become the main competitor, with its Stag Beer and the newly launched Ti la biére. As for the cost of alcohol in Mauritius, a typical 65 cl bottle of lager (slightly larger than the imperial pint of 57 cl) in an average supermarket will set you back around Rs 40-50, depending on the store and the location. Expect to add some 20% and upwards for imported lager, such as Heineken or Kronenbourg 1664, two other popular lagers found in most larger supermarkets. As for rum, the cheaper types of rum in Mauritius can be bought for as little as Rs 75 for a 75 cl bottle, or a rupee to every centilitre if you wish, whereas popular rums, such as Green Island, will set you back some Rs 200. 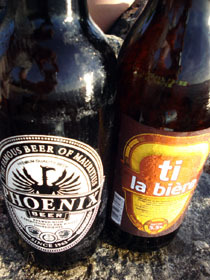 Imported alcohol in Mauritius is subject to Government tax, and as such the prices are typically similar to, or more expensive than the country of origin. Hence, it will typically pay off to buy your favourite vodka or whisky on the flight to Mauritius, or at airport duty free on the way, rather than buying it in a local store in Mauritius.